These beauts are addictive, and actually pretty easy to make. They are toasted almonds and walnuts, covered in a dark milk chocolate and rolled in golden caster sugar. Simple and delicious. Toast the nuts by placing them on a tray in a 180°C oven for about 7-10 minutes. You will smell them when they are ready! Mm… toasty. Let the nuts cool and transfer them to a large bowl. Drizzle a tablespoonful of tempered chocolate over the nuts and quickly mix with your hand until they are all lightly coated. Drizzle again and repeat until the nuts (and your hand!) are chocolate-covered to your desired thickness. 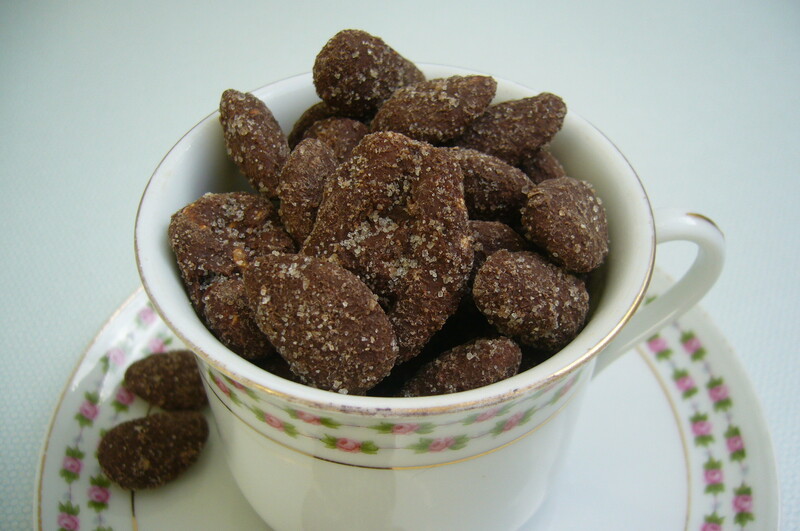 After your last drizzle, quickly drop the nuts into another bowl containing about a cup of sugar. Do what you do best and mix them all up again. Free the nuts from their bowl of sugar and leave to set for twenty minutes or so. YUM. Crunch crunch crunch.